Will the real Brandon Lang please stand up? This one is a real headscratcher. I have to make an initial disclaimer before diving in – my firm is currently representing a defendant in an unrelated case brought by the same plaintiff in this case. This post reflects my personal opinions and is not related to any issues in the case I’m working on with the firm. Sensing marketing opportunities, Stevo submitted a service mark application to the U.S. Patent and Trademark Office (“USPTO”) for the mark “BRANDON LANG” for the following services: “Handicapping for sporting and other entertainment events.” The application was submitted March 15, 2007, and a registration ws issued on June 17, 2008. The registration information may be viewed HERE. It’s somewhat rare, but not unusual, for a living person’s full name to receive a trademark registration, but given the obvious boost in visibility that the movie would bring to Stevo’s services, it makes sense that Stevo would want to protect the Brandon Lang “brand.” Following the success of the movie, Brandon Link continued offering his handicapping services under the Brandon Lang name. As alleged in the complaint, at some point the relationship between Brandon and Stevo broke down. The details are in the complaint, but ultimately, the parties decided to part ways. They signed a separation agreement, and one of the counts in the complaint is based on Brandon’s alleged breach of that agreement. So, doesn’t Stevo still have the right to prevent others from offering services under a trademark registration owned by Stevo? Absolutely. But here’s the problem. In order to obtain a trademark registration for a personal name, the applicant must inform the USPTO if the mark does indeed identify a particular living individual, and if so, then that living individual must submit a signed consent statement indicating that he or she consents to their name being used in the trademark application. As THIS document shows, on June 23, 2007, the USPTO Examining Attorney followed proper procedure by asking Stevo if Brandon Lang was a living individual, and if so, then a consent form was required. If Brandon Lang was NOT a living individual, then Stevo was supposed to reply as such. Responding three days past the six month deadline for a response, on December 26, 2007, Attorney Mark Jordan submitted a signed consent form from “Brandon Lang.” You can view the form HERE (see page 3). Say huh? 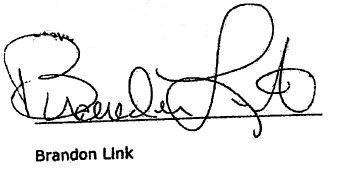 Sure as heck, on Christmas Day, 2007, one “Brandon Lang” signed his name to a form indicating that he consented to his name being used in the trademark application. Rut-ro. I’m also no handwriting expert, buuuuuuut….. So here’s the problem. If there is no living individual named Brandon Lang, and Stevo (or the attorney handling the application) knowingly submitted a document that [cringing] falsely [/uncringing] represented that Mr. Lang does exist, then the entire trademark registration is at risk. That means canceling the registration – or perhaps the registration would be void. That means no trademark infringement as to the registration. This is a fascinating issue – a real person signs the name of a fictional character loosely based on his own persona in an attempt to register the fictional character’s full name as a trademark. Ultimately, if the trademark registration is canceled, I think hindsight will show that a simple response to the Examining Attorney’s June 23, 2007 office action indicating that “Brandon Lang is a fictional character” and/or having Brandon Link sign his real name for the “Brandon Lang” pseudonym would have prevented this entire mess. Wonder what the odds are?